SLN Spotlight_SAP Labs India: S/4HANA On Premise – How to Configure FIORI Apps? At times, users come across many issues like system alias, services activation, server errors while testing Fiori apps in S/4HANA OP landscape. The issues are generally due to incomplete configuration. Based on my learning, I am listing down the steps one can follow to setup Fiori apps in S/4HANA OP Landscape. As OData services exists in gateway system, all the settings listed below are applicable to Gateway system. Create user with same name in backend system (where data exists) and gateway system (ODATA’s are available) via self-service. It’s good to maintain same password for user in backend and gateway system, as this will avoid unnecessary pop-ups asking for password. Assign the required business roles for FIORI app to the user created above (Transaction: SU01, Tab: Roles). In case you do not have information on roles, please check the same at FIORI apps library. In Fiori apps library, search for an app –> Implementation Information –> Configuration. Here, you can check the business roles and ODATA services needed to test an app. Enter RFC created in step (3) in field ‘RFC Destination’, ‘Software Version’ as Default, and meaningful text in ‘SAP System Alias’ and Save it. The Fiori apps does not load in Launchpad unless a system alias is added to it. At times, users just create a type 3 RFC and if try to assign the same, then RFC is not available. Hence, this setting is important! Till now I explained about user creation in both backend and gateway system, assigning business roles to gateway, creating RFC and how to map it to SAP system alias. 5. Next step is to Activate Services. To activate a service, go to transaction /N/IWFND/MAINT_SERVICE. Find the service relevant for your app (you can check the service details in Fiori apps library as mentioned in step (2)) via Find…. Select the service and ensure that status of ODATA is green that signifies service is active. If ODATA is not active, you can activate it by clicking on Manage ICF Node –> Activate. Click on ‘Add System Alias’ –> New Entries. In new entries window, enter sap system alias created in step (4) in field ‘SAP System Alias’ and hit Enter. Other fields are populated automatically. Save changes. 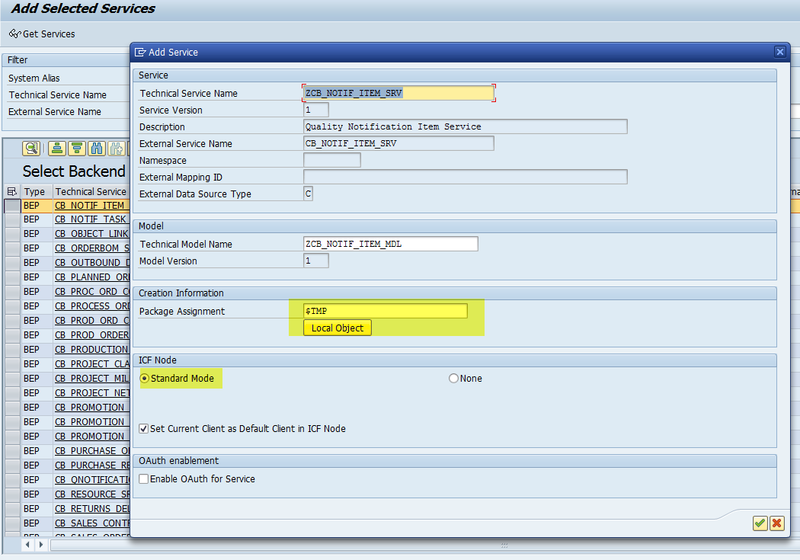 You can repeat step (5) and step (6) for all OData services relevant for your application. The above-mentioned steps are mandatory for Fiori apps setup in S/4HANA OP landscape. Once completed you can check the apps in Fiori Launchpad. Resolution: You encounter this issue if services are not available in transaction. Resolution is to add the services and activate it as mentioned in above steps. a. Click on ‘Add Service’ in same transaction. Click on continue. A success message appears that service was created and its metadata is loaded. Now you can find the added service in /iwfnd/maint_service. Resolution: Such type of error can be checked in console. You can open browser console by F12.